After almost two decades, a full-size space shuttle model was moved on Sunday, Dec. 11, 2011, from Kennedy Space Center Visitor Complex to make space for a real shuttle. The high-fidelity replica Explorer was trucked on top of a wheeled-transporter to a turn basin about five miles away, where in a few months it will depart via barge to Texas for display at Space Center Houston. A static full-scale space shuttle display did something unusual on Sunday morning (Dec. 11) — it moved. Named Explorer, the 122.7-foot (37.4-meter) long shuttle replica was hoisted onto a wheeled transporter and trucked the 5.4 miles (8.7 kilometers) from NASA's Kennedy Space Center Visitor Complex to a turn basin adjacent to the 52-story Vehicle Assembly Building, where real space shuttles were once prepared for launch. It was the first time in 18 years that the mock shuttle was moved. Explorer will wait there until it is shipped by barge from Florida to Texas in the next several months, where it will be displayed by Space Center Houston, the official visitor center for NASA's Johnson Space Center. 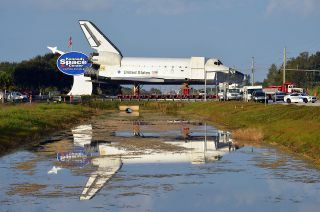 The move was necessary to clear room at the Kennedy visitor complex for a new $100 million, 64,000 square-foot facility to display the space shuttle Atlantis. Now being prepared for display after flying the final mission of NASA's 30-year shuttle program in July, Atlantis will make the same overland trip as Explorer — in the reverse direction — in November 2012. In addition to offering the public a realistic exterior appearance and a sense of the scale for the real winged shuttles, Explorer also features a walk-through interior, including the payload bay and crew cabin. Visitors could ascend a gantry-style tower positioned alongside the 54-foot (16.5-m) tall replica and view a mock satellite inside the cargo hold and see the commander's and pilot's stations on the flight deck. Space Center Houston plans to preserve and perhaps enhance Explorer's interior tour. Visitors to Atlantis in Florida and the other authentic orbiters will not be able to go inside. Before Explorer could depart for its temporary waterside parking spot on Sunday, construction crews needed to first remove full-size replicas of the shuttle's solid rocket boosters and external tank that were displayed separately adjacent to the orbiter. That work was completed Dec. 1 as they were trucked to NASA's transfer and disposal yard to await their next move, still to be decided. Explorer then needed to clear its own hurdle: a guard house that divides the road leading to the turn basin. Workers raised the replica shuttle on its transporter so that its 78-foot (23.8-m) wingspan could clear the small building. View photographs of the replica space shuttle Explorer on the move at collectSPACE.com.